Please bookmark and link to Music Worldw and Music Worlda which will point to wherever this website is currently located. One free webhost after another has either shut down, limited bandwidth, or cluttered my webpages with advertisements. If you found this page from a search engine, chances are you'll never find it again so Bookmark those webpages now!! If you found this webpage from a search engine, search for multiple instances of your search query. If anyone knows of any inaccuracies on this webpage, Email ME here (remove the NOSPAM. part from address and change subject to 'Inaccuracy report Audio') and I will correct them immediately upon verification. 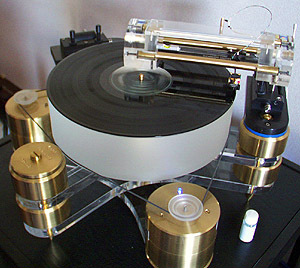 Article, Gary Markowitz: "Understanding The Issues Behind Cartridge Alignment"
Article, Forbes Magazine: "Going vinyl"
Article, Forbes Magazine: "Vinyl vs. CDs: The Tables Are Turning"
Article, Forbes Magazine: "Vinyl Continues Unlikely Recovery, According To New Numbers"
Article, Forbes Magazine: "Ode to Vinyl Records"
bi-axis inertia controlled dynamic balance type tone arm, you've got to see this! I can't really recommend a fluid because there's no consensus on what's the best. I'd just buy a gallon of whatever the machine's brand sells. The biggest dealer of record sleeves for LPs, 78s, 45s is Far West Record Supply which is listed on my "records" webpage. Clearaudio Record Ring this heavy record ring fits around your warped records onto Clearaudio turntables making them playable again. 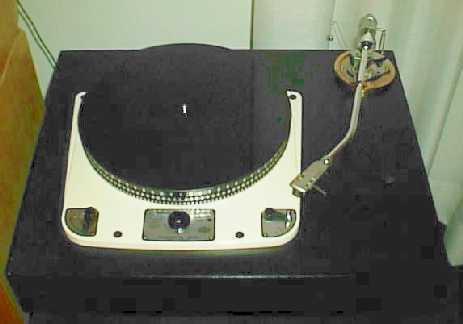 The turntable must have a lot of torque to be able to spin the weighted patter. Clearaudio Der Accurate Power Generator This power unit claims to clean up the dirty, fluctuating power and turn it into a "ideal, distortion-free voltage and current, galvanically isolated from the grid" power. The result is "a relaxed, realistic soundstage". 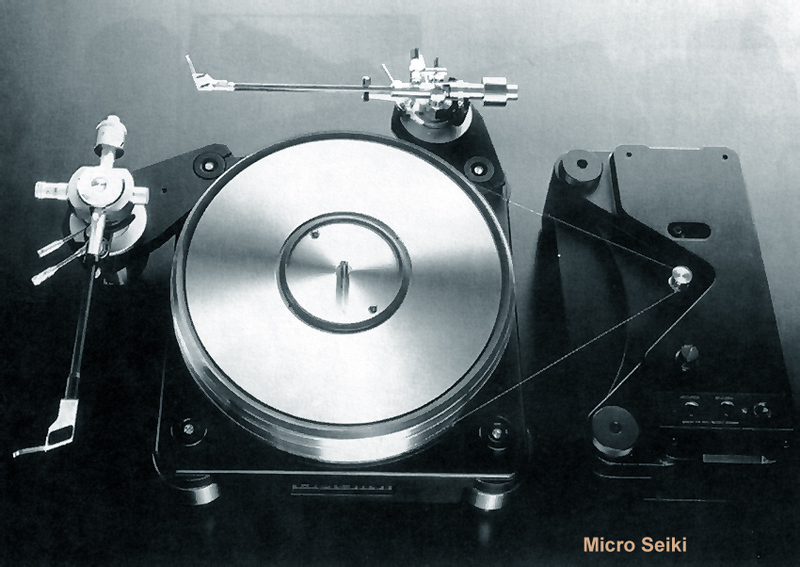 Audiocraft makes a turntable arm that just holds a brush which removes dust from the grove right before the cartridge; I've seen this only installed on Micro Seki turntables though. 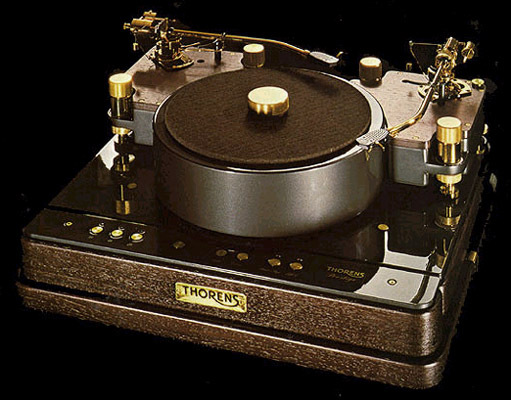 THORENS Stabilizer would you believe this 1.2 lbs thing costs $195? Article, Forbes Magazine: "Think The Cassette Tape Is Dead? Then Why Did Sony Just Squeeze 185TB Of Data Onto One?" Is there life left in the humble compact cassette? Ametron sells normal blank cassettes. MusiciansFriend sells blank Trutone and TDK tapes online. J&R sells blank cassettes online. There are many old mom and pop businesses and pro-audio stores that have old stocks of high quality cassette tapes. Metal and chrome tapes are better thank normal tapes. 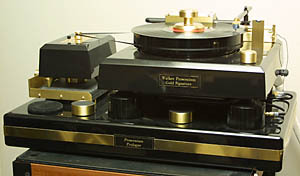 Pro-audio stores sell pro-quality tapes. The best blank tapes were TDK MA-EX which were only sold in Japan. Blank metal tapes and chrome tapes are becoming scarce so buy them while you can. Radio Shack sells cassette head cleaners so buy them while you can; at their stores they sell cleaners by Trackmate and Radio Shack, online they also sell cleaners by Maxell. WalMart sells Normal Sony blanks. DIY codefree modifications you can modify your DVD player to enable it to play DVDs from all six region codes, make it "code-free", multiregion, most Asian owned shops (Chinese, Vietnamese, Japanese) have techs who can do codefree modification for you; that's the only way they can view imported DVDs. Article: There's Life Above 20 Kilohertz! 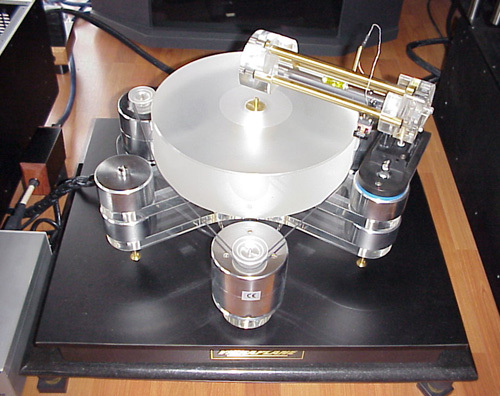 This is an emerging technology which at once will obsolete DAT, CD-R and CD-RW. Mini Disc is already obsolete. 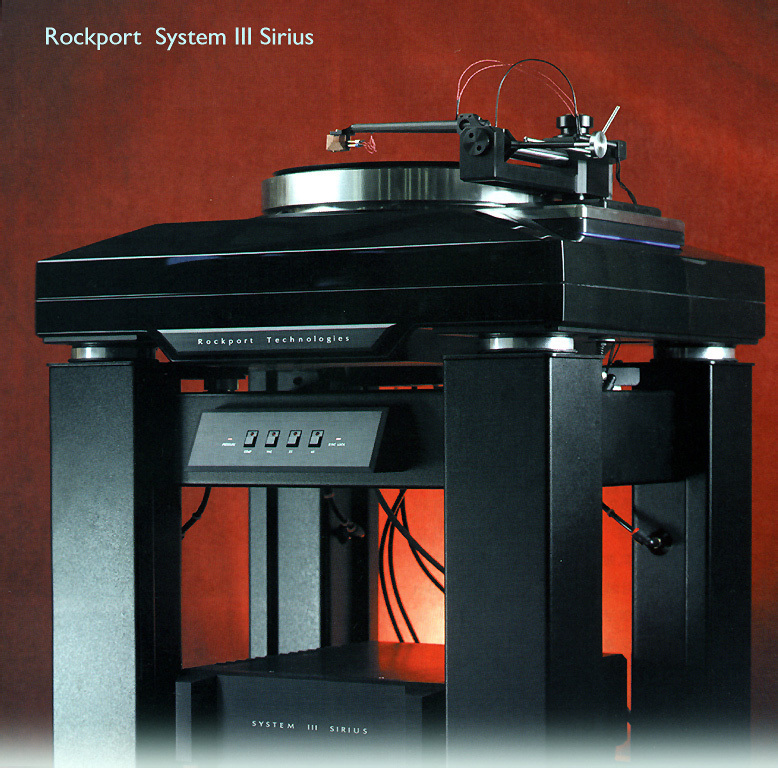 The best digital still does not have the musical qualities of the best analogue. CD players are obsolete! 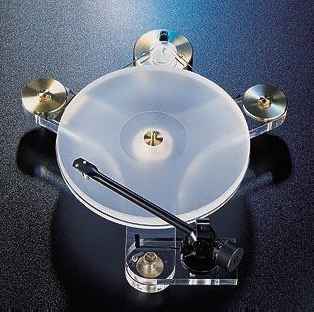 The future is with "music servers" such as the Linn-Knekt Kivor and Sony HAR-D1000. You'd load your CDs into these machines and organize your playlists. You can send the digital data out from the server to your A/V receiver's DAC. 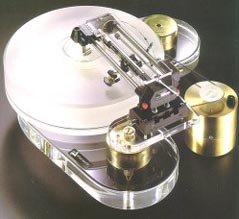 Until such "music servers" become more popular, there are many good mechanical CD changers. In the future, "music servers" will be computer servers with a laptop computer interface. The only time you'll handle CDs is when you remove them from their cases to copy them into the servers. 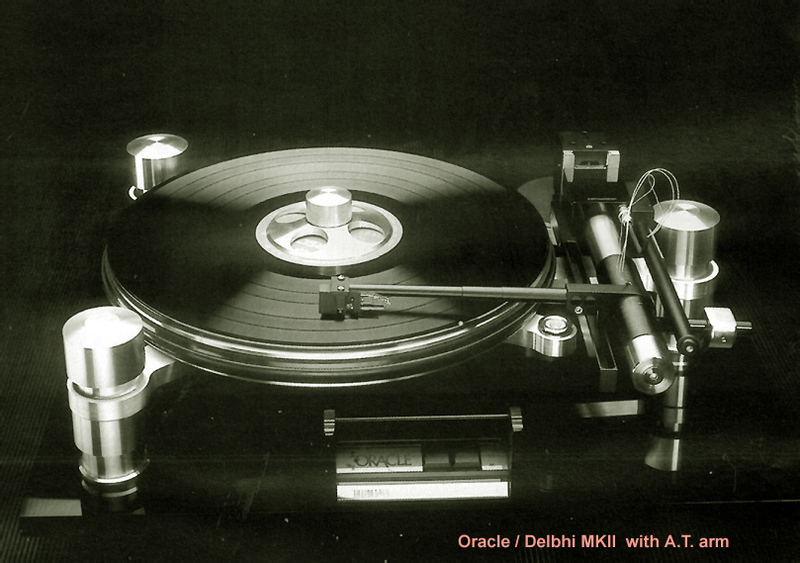 If the record labels persist with copy protection, the record labels might kill the "music server" market. The computer you're using right now is a MP3 player, you just need good amps and speakers to hear it. The advantage of the MP3 format is that you can get all the songs you want for free, the disadvantage is that the quality is inferior to that of CD and worse than MiniDisc, the mitigating factor is that most CHR "Top-40" pop music is highly compressed for radio airplay so you can't hear an audible difference for most pop recordings. It's a disposable format where people download from the internet to their computers free MP3s of the current ephemeral pop charts and later delete them and write over those files the next batch of current ephemeral pop chart songs. It's the perfect erasable format for disposable music. The best use professional audiophile components, born out of a synthesis of professional audio recording studio design and high end hi-fi expectations, designed for critical reference applications: mastering facilities, project studios, high end hi-fi. There are no car stereo amps attached to the back of these speakers, no fancy lights or graphics, some have digital inputs and internal amplifiers; in fact, these speakers may not be what you want to hear, but what you need to hear. 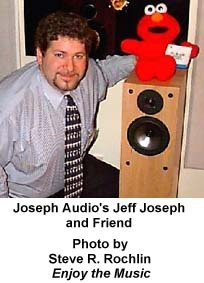 Go to the websites of the studios that mastered your favorite recordings and see what speakers they use. I don't know if Axiom, BIC, and Dahlquist are actually the same brand because they sure look alike. You already know that Harman is JBL, Revel, Infinity, Harman Kardon. Infinity Epsilon picture Infinity Sigma picture, picture Infinity Vintage Speaker page now that Harman owns Infinity, JBL, Revel speakers they make sure their best engineers only design their best products for the more expensive Revel brand and the top of the line JBL speakers; Harman's quality of Infinity speakers has went down since the original Infinity owners sold out and formed Genesis Speakers; Infinity sells their best speakers in Europe and Asia such as their Alpha 50 and those sold by Denon in Japan; for the USA market - their speakers with side firing woofers dissappoint; they look nice in photos but when you see and hear them in person - they are "cheap"
This was trend in hifi for a while. 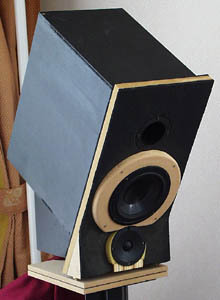 Some hifi enthusiasts added super tweeters to their speakers to accomodate the improved dynamic range that DVD-Audio and SACD formats are supposed to have. Caltech professor and musician James Boyk has pioneered research in this field at the Caltech Music Lab and has written this report which suggests the need for super-tweeters, "There's Life Above 20 Kilohertz: A Survey of Musical-Instrument Spectra to 102.4 kHz." 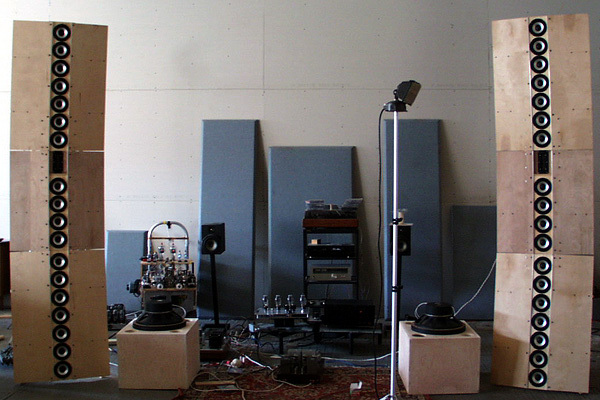 He also runs the Caltech Music Lab Auditioning Facility for subjective evaluation of components for the audio industry. 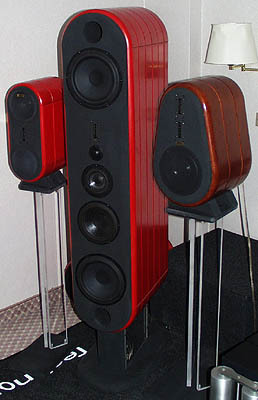 Now that some manufacturers are selling seperate "suptertweeters", all high-end speakers ought to have "suptertweeters" built in; high-end manufacturers certainly charge enough. Nothing! Every in-wall speaker I've ever heard, every installtion that had in-wall speakers, regardless of the price and cost of installation, sounded terrible. The problem is that the entire wall that the speaker is attatched to vibrates with the speaker creating one giant rattling, buzzing, distorted noise. There are many self powered speakers sold at pro-audio stores such as Guitar Center and Sam Ash Music. Bass is directional. So the left and right speakers need one placed close by or under them. For movies, you only need one placed under the center channel as in a movie theater. Harman brand's Infinity subwoofers have the worst reputation for reliability, almost as bad as BIC's subwoofers; Harman's JBL and Revel subwoofers are much better and the former Infinity founder's Genesis subwoofers are much better than those sold by his former company. 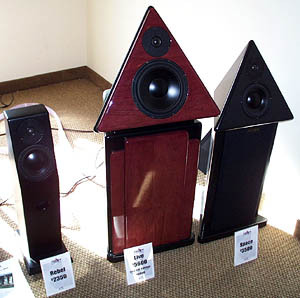 Your choice for center channel speaker depends on the kind of speakers you're using for your left & right channels. Get whatever brand's model that matches the same price and series tier as your other speakers. Most of the sound from movie soundtracks is in the center channel. Use whatever speakers you're upgrading from as your rear channels. If you want new ones, your choice for rear channel speakers depends on the kind of speakers you're using for your left & right channels. Get whatever brand's model that matches the same price and series tier as your other speakers. Bose Bose speakers in Japan are far superior to the speakers they sell in the rest of the world. Bose car stereos for Honda Acura cars are pretty good. Bose compter speakers are good. But Bose home stereo products in the USA are junk, Bose FAQ, The problem with Bose, The Dark Side of Successful Product Marketing - Bose, Better Profit Margins Through Shortcuts. 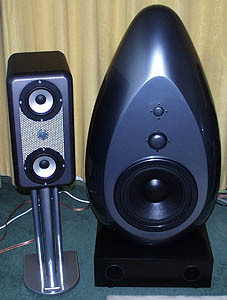 If you want small speakers, Gallo Speakers are far superior. I think Bose designs are good, but they use the worst cheapest materials. Just say 'no' to Bose. Email Bose to let them know your suggestions to improve their products. Perfect for weird music. 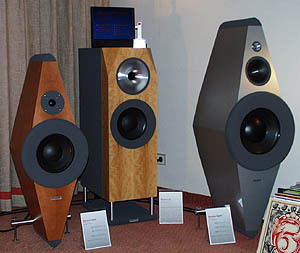 I need links to more speakers that look like rocks. I'm looking for links to a speaker which is supposed to have an oxygen/gas tweeter that you're supposed to ignite to listen to like the Acapella and Magnat Plasma speaker. Gas tweeters are the most perfect and neutral tweeters with a frequency response extending up to 100kHz (thus they also cover the area of a supertweeter without a crossover point). The use of plasma tweeters was abandoned many years ago due to the fact that they produce Ozone (O3). Ozone is very useful at the stratosphere levels but not in lower levels due to its aggressiveness and corrosiveness. It attacks nearly everything including our lungs! 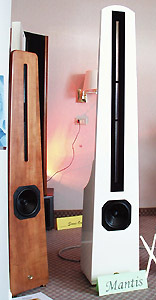 Cinemateq 5.0 sound system "natural"
Floating Synthesis from the Netherlands, four-way loudspeaker ($15,900 per pair). This unique and substantial design weights 159 lbs. 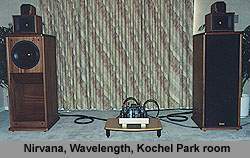 and reproduces frequencies from 16Hz to 25kHz. Induction Dynamics speakers point into the box? Brain Nerve Stimulator speakers point into the box? you must read their website's spiel! 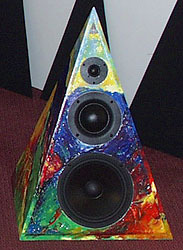 Shadow Sound Orion guarantees their hand-painted speakers will retain the resale value due to the intrinsic value of the artwork. 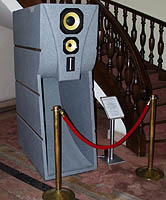 Souno smallish about 3-incher in a cabinet around five feet high, there are two resonant chambers inside specifically designed to enhance the lowermost frequencies. 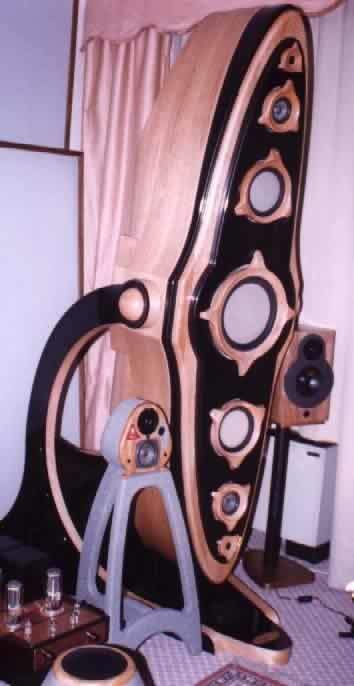 Wilson Benesch speakers point away from the listener into the box? 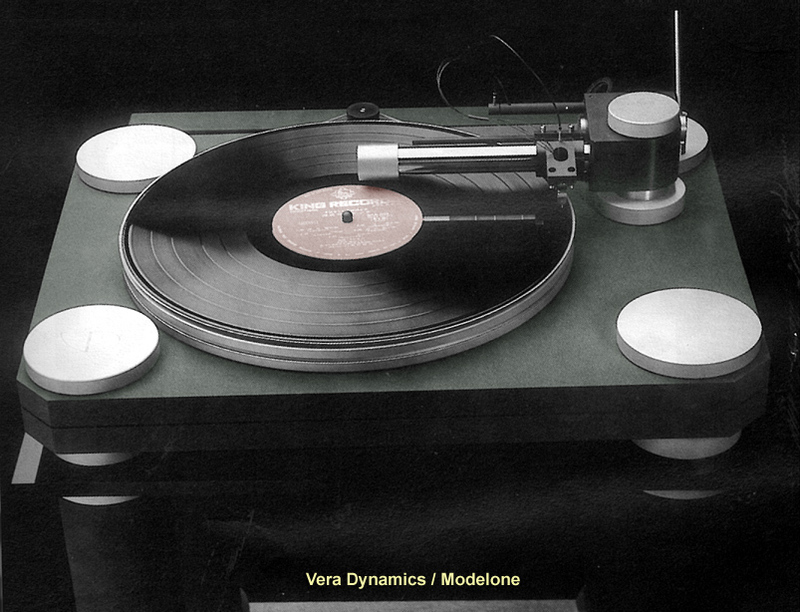 Audio Research, VTL, and VAC are the best, ultimate, hi-end preamps, the benchmark for all others. Sony's Japan-only products are great. As much as I love Audio Research's sound, their control knobs and remote controls are terrible. 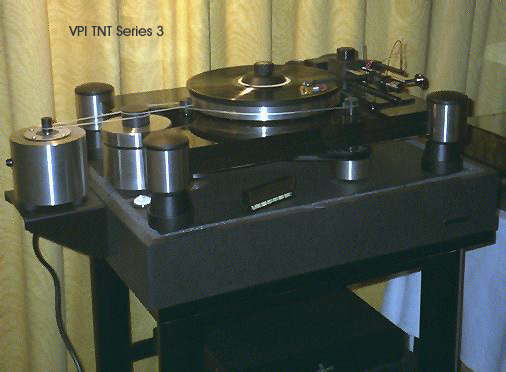 Audio Research, VTL, and VAC are the best in production, ultimate, hi-end amps, the benchmark for all others. 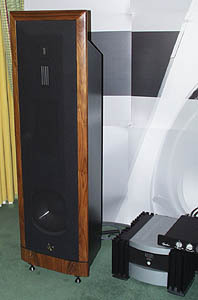 The best amp I've heard was the now out of production Wavestream Kinetics V-8 Monoblocks which were outrageously expensive. The most expensive amps are made by Wavac. For efficient and/or small speakers, you can use smaller amps less than 100 watts from 8 watts to 60 watts. Manufacturers and magazines ought to list the products' current in Amps, or Amperes. 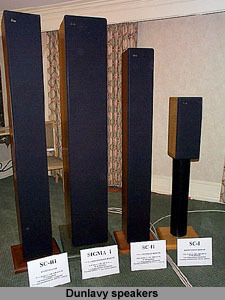 Some larger speakers and electrostatic speakers require more power. 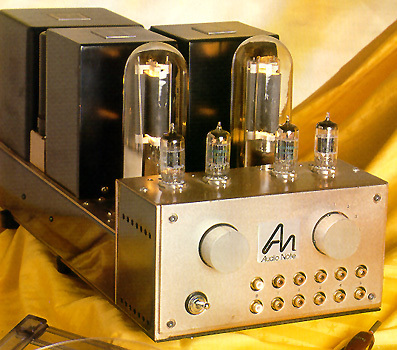 AR amps use vacuum tubes and produce crisp and clean signals. 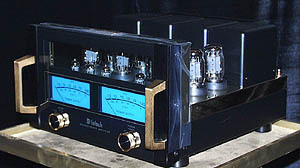 The best solid state amps are by Audio Research and Sunfire. 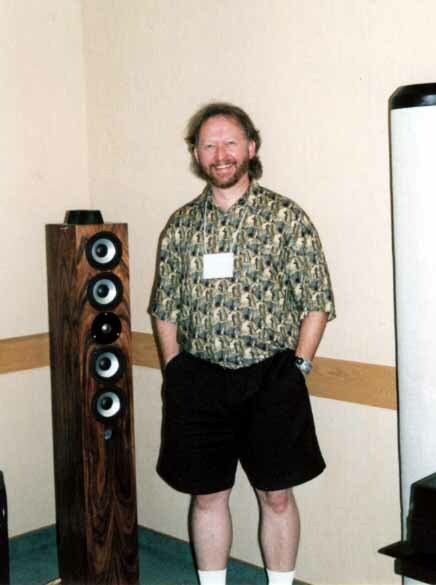 The edge that makes Sunfire better than oversized, overdesigned, and overpriced brands like Mark Levinson, Krell, Boulder, Spectral, Conrad Johnson, Theta, Pass Labs, Tact Audio, Sim Audio, Audio Note, Audire, FM Acoustics, Burmester, Accuphase, etc., is that Bob Carver is a genius. 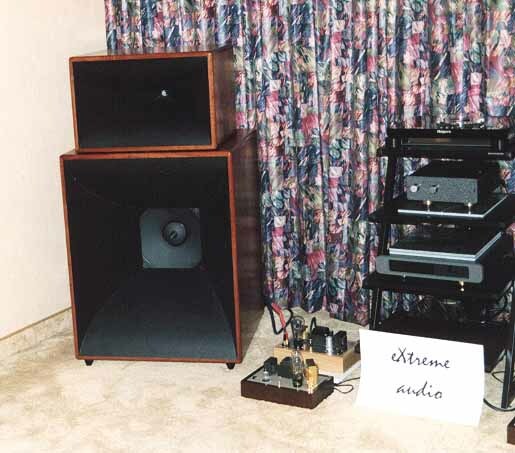 Article: "The Cool Sound of Tubes"
Article, Rod Elliott: "Amplifier Basics - How Amps Work"
Article: "How a Simple Diode Vacuum Tube Works"
Audio Research, VTL, and VAC are the best, ultimate, hi-end integrated stereos, the benchmark for all others. As much as I love Audio Research's sound, their control knobs and remote controls are terrible. Sony's Japan-only products are great. Manufacturers and magazines ought to list the products' Amps, or Amperes, to indicate their current. These mini stereo systems consist of preamps, amps, tuners, CD players, and speakers. Unfortunately, most mini stereo systems' selling points are their size and are usually lacking features such as HDCD, CD-TEXT, phono preamp inputs, and Nakamichi-level-quality tape decks. Bang & Olufsen created this niche market and Japanese and other companies have been copying B&O's style for years, this is especially evident with Sony, Sherwood, Fisher, and Pioneer mini hifi systems. If you have the money, Bang & Olufsen is the best. A lot of these products are made in China so they're annoyingly overpriced. Some of the best headphones, which I've not listed here, are pro-audio recording studio headphones sold at pro-audio dealers like Guitar Center, Sam Ash, and others. I do not recommend "noise cancelling" headphones because while you're trying to listen to loud music, the "noise cancelling" headphones are blasting your ears with dangerous volumes of 'anti-sound'. When I tested "noise cancelling" headphones in a silent room, I felt pressure on my ears that was uncomfortable. Your ears are being blasted with the SPL of not only the music, but also the cancellation sounds. I do not trust "noise cancelling" headphones at all. RDS + ID-Logic, Radio Data System with a 64 character display, and allow sorting by format. Many car stereos already have all these features. The hi-er end manufacturers have to catch up to the technology. Future digital radio/sattelite/cable/internet radio technologies: XMRadio, Music Choice, Spinner.com, Command Audio, and CD Radio; read and evaluate them for yourself. Roger Russell, McIntosh labs engineer: "Speaker Wire-A History"
ROY FURCHGOTT, New York Times: "DOWNTIME: A Spat Among Audiophiles Over High-End Speaker Wire"
James Randi: "Sounds Like Acceptance"
James Randi: "MORE CABLE NONSENSE"
James Randi: "James THE END OF THE STEREOPHILE EXCHANGES � FOR NOW"
James Randi: "Blake Withdrawls from PEAR Cable Challenge"
James Randi: "James Randi Calls Out Audiophile: I'm Sure the Crickets Will Sound Fantastic"
Consumerist: "Do Coat Hangers Sound As Good Monster Cables?" Article, Forbes Magazine: "Selling sizzle with sizzle"
Article, NY Times: "NY Times Rekindles Cable Debate with 'Circuits' Story"
Article, Rod Elliott: "I Am As Mad As Hell!" Article, Rod Elliott: "The Truth about Cables, Interconnects & Other Stuff"
Article, Rod Elliott: "Audio Cables - Fact & Fiction Revealed"
Article, Robert Harley: "Audio McCarthyism"
Synergistic Research Cables the only expensive audiophile cables I've heard that actually made an improvement in sound are their Active (X2) speaker wires. Active Shielding actually works. Brick Wall Audio Div., Price Wheeler Corp. their website said " 'If P.T. Barnum were alive today... he'd be selling surge suppressors'- UL technician, If you wanted to make a standard outlet strip a surge protector it would cost literally less than 50 cents. That is why you can buy these products at the local electronics emporium for $10 or less. " This technology is improving so fast that I will now only list the brands that are making the best products. Look for each brand's latest models, not nessesarily their most expensive models, for their latest models will have their latest technology. These expensive projectors have to be re-calibrated every few months. All projectors ought to have HDMI, DVI, and Firewire inputs. Big screen TVs are actually on their way "out" of the marketplace. They are being succeeded by flat screens. Don't bother buying one, seriously. The companies listed below consistently make the higher end models. The technology is improving so fast, there is a new "best" model every few months, but I predict they will all discontinue their models later this year. Remember, for optimal performance, a tv must be color calibrated. Since HDTV with 1080i specs and 16x9 picture is the new standard for widescreen viewing, maybe I ought to stop listing tvs that aren't. The best have VGA-type 15-pin connectors. Actually the computer monitor you are looking at right now has more resolution than HDTV. All TVs ought to have HDMI, DVI, and Firewire inputs. These companies consistently make the higher end models. Remember, for optimal performance, a tv must be color calibrated. Since HDTV with 16:9 is the new standard for widescreen viewing, maybe I ought to stop listing TVs that aren't. The best have VGA-type 15-pin connectors. These change so fast, almost monthly, that I'm just going to link to the best brands. Look for the latest top of the line models by Pioneer Elite. All monitors ought to have HDMI, DVI, and Firewire inputs. For sane music clarity, unless you have "room treatment", you're wasting your money on everything else. The more experience I gain with audio, the more I'm realizing that the room might be the most important component of all. Read those articles. Maybe you need a padded room if you're going to spend hundreds of thousands on a stereo! George Cardas: "Listening Room Design"
Rudolf A. Bruil: "There 's no greater joy than to have well positioned speakers." Allen Perkins: "Principles and Techniques of Speaker Placement"
Townshend I can't say if this really works, but it looks really cool. 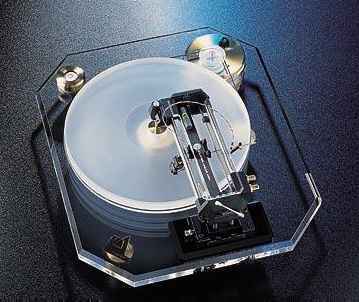 Maybe you can use it for your expensive turntable so when you dance around the room, your floor thumping doesn't cause the needle to skip. Their reasoning for vibration isolation for amplifiers and non mechanical components is wacky. Their site critisizes other brands' "vibration isolation" products as "virtually ineffective." Connect the RCA line outs from your preamp to watch a light show. ABX Double Blind Comparator why don't all magazines use such systems?? WireWorld Blind Comparator, why don't all magazines use such systems?? this is a brand that makes expensive cables the magazines praise, so why don't they use this device?? pARTicular Evrythmy the most insanely overpriced racks, $25,000 for a rack? 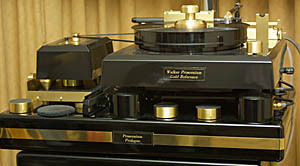 If you aren't a millionaire and want a "serious" audio system, want something better than mass "consumer grade" electronics, want something better than the gimmicky booming junk, and would rather spend money on albums and concert tickets for music, then look into the top of the line products by these brands to hear "Hi-Fi" at the affordable entry level: Pioneer Elite, Sony ES, Rotel, NAD, Harmon Kardon, Marantz, Nakamichi, Sherwood. You can buy complete systems by each of these brands and then use one remote control for everything. For an entry level home theater integrated receiver, the Pioneer Elite is worth listening to. 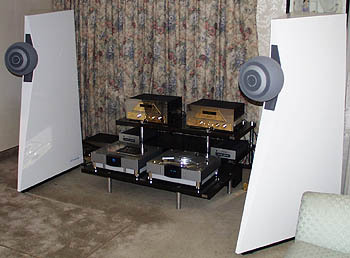 To start entering into the more expensive hifi, look into the brands: Sunfire, Golden Tube, B&K. For speakers, I recommend the affordable models by the brands listed above including: Legacy-Audio, Klipsch, NHT, KEF, Infinity, Joseph Audio. You would think that as technology improves, consumer electronics should be getting better, more endowed with features, and less expensive. When you buy an expensive component, you can usually negotiate buying any accessories at cost or even "thrown in". 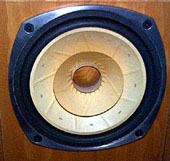 Many speaker manufacturers "throw in" center channel speakers when you buy L+R speakers. You can usually buy refurbished units, store demos, and trade-ins at any audio store at deep discounts. To vegetate on for hours while enjoying your home entertainment, I recommend the expensive recliners at sold at Superco stores. Some of them will massage your back. See below for addresses. You might consider installing exercise equipment in your listening room or installing stereo equipment in your exercise room. OSIM chairs are very relaxing. 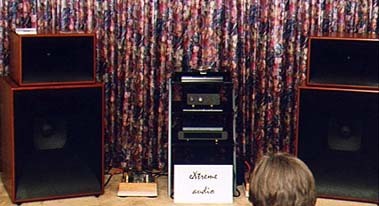 Avalon Acoustics demo room at Hi-Fi '98, I am still haunted by my experience listening to hifi in this room. It was amazing. The Audio Critic, Sensible Sound, and Attainable Audio have journalism with attitude. They are the most opinionated of all audio magazines and actually give other audio magazines bad reviews and debunks psuedo-science products. 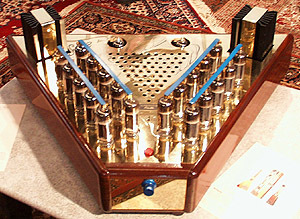 AudioXPress, Bottlehead's Valve, and Vacuum Tube Valley are what the hi-fi hobby used to be about - DIY. 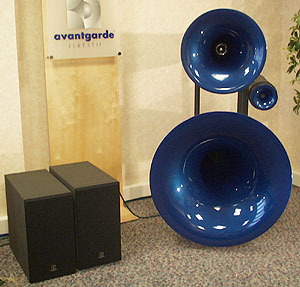 AUDIOPHILE STORES: Very expensive audio equipment can be heard at these places. Always call first to ask for their hours, what equipment you're interested in, and be sure to mention you found out about them via me. Bring your own CDs. When you bring test CDs, pick ones with widest dynamic ranges so you can hear deep bass with bright treble. Also bring CDs that sound muddied so then you can hear how well the audio equipment "cleans up" the sound and you can hear how much more detailed the soundspace image is. Beware that each dealer claims to be the exclusive distributor for each brand, but this is never the case. My audiophile tests are: to listen if the lyrics are more intelligible, if the horns sound more real, if the bass sounds more defined, and if you start feeling like dancing to the rhythm. 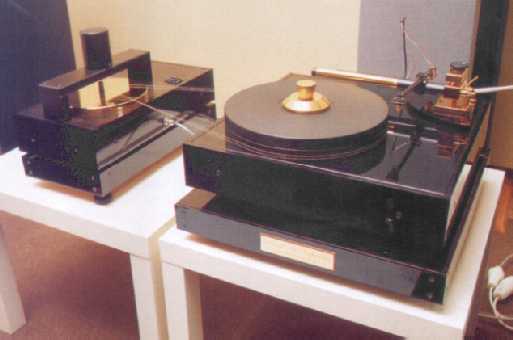 Some components have "synergy" and sound better combined with others. Good components with a bad speaker will not sound good as would bad components with a great speaker. Sometimes good components just don't sound good together too. Ask to switch components around to make your A/B/? comparisons. I wish you good luck in finding the audio system that makes your music move you. All of them sell CD players. 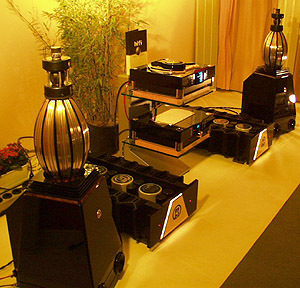 There are concentrations of hifi dealers in the most affluent areas. In West Los Angeles there are many dealers located on Wilshire Blvd west of the 405 Freeway. In Torrance there are many dealers located on Pacific Coast Highway and on Hawthorne Blvd. 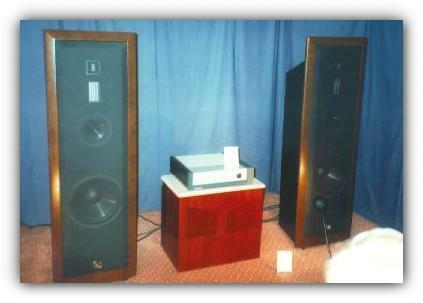 Magnolia HiFi dealers are changing the way hifi dealers look with their well designed showrooms. The older dealers may not have stores that look as nice as Magnolia, but they have good prices on trade ins, demos, new-old-stock equipment, and used equipment. 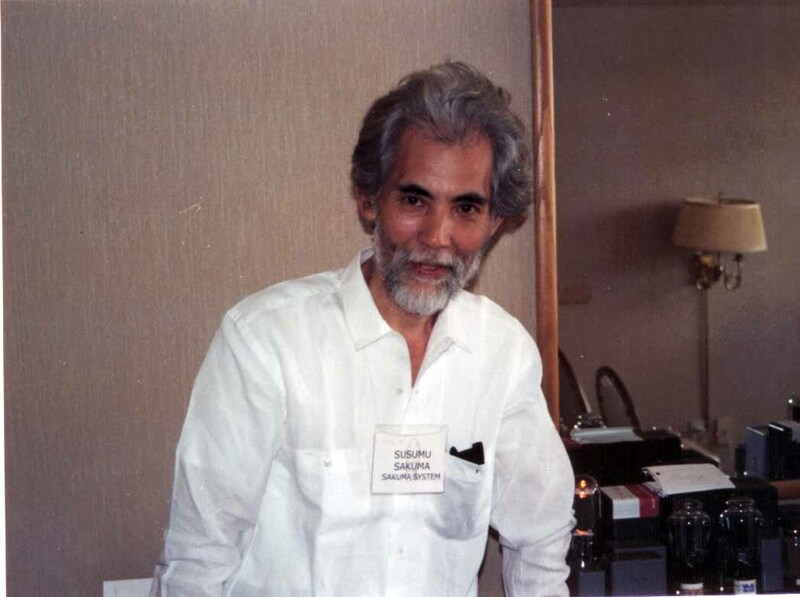 Caltech professor, musician, consultant for the audio industry, record producer, also runs his own hifi consulting service and does not sell or install components, but will make referrals to those who do. no hifi, they sell massage chairs. 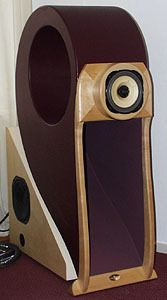 Stanley Song and Tony sell Canary Audio, RA Design Lab, Nieman, B&W, Krell and other hifi brands. Great auditioning room. Bring your own CDs. 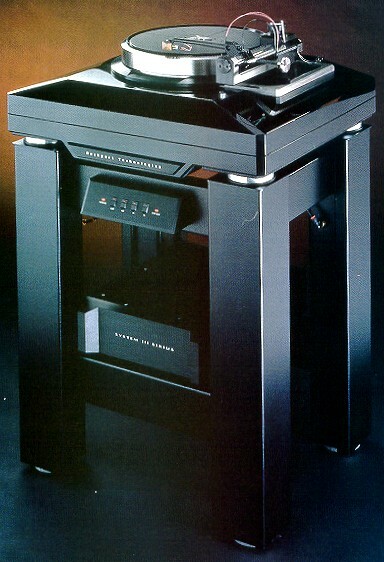 Mark Levinson OEM's Chinese made hifi equipment by Korsun and sells them at very high prices under his brand. 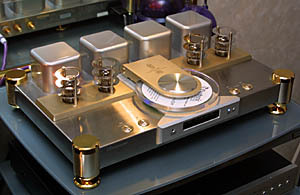 Look at his photo of his $2,000 "Rosette 1 Integrated Amplifier", the rose obscures the logo of another brand, the Chinese made "Korsun U2" which sells for under $200. 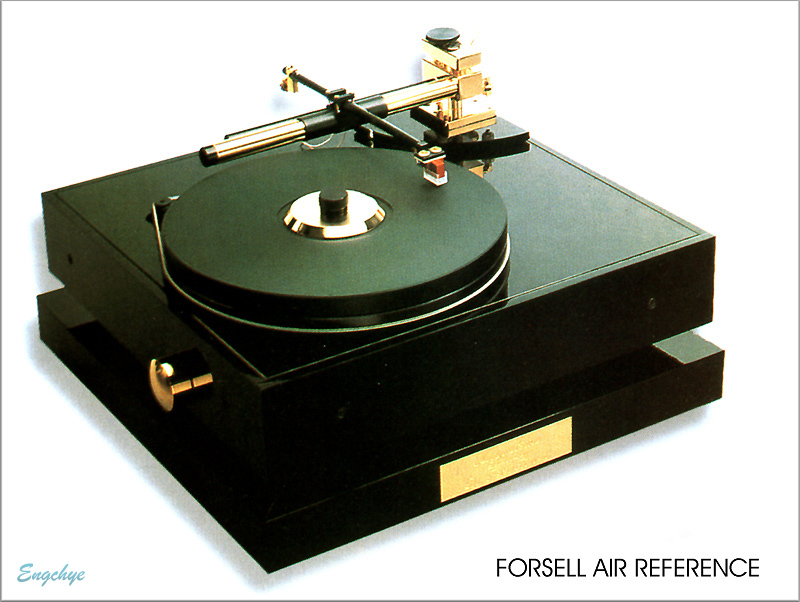 Email Korsun and ask them to sell their products at hifi dealers that are close to you. Nakamichi head units are the best, there really isn't any other alternative for quality, especially if sound quality is your main priority. Unfortunately, they stopped importing their best products to the USA so you can only find them used or new-old-stock. Car GPS Units Maybe it is better to keep the GPS external from your car stereo. That way you can take your GPS from car to car and be able to update it easier. A lot of these GPS brands look identical. These devices will probably become obsolete as smartphones have built in GPS. Most car stereo speakers, even the expensive ones, sound crappy. Most aftermarket car stereo speakers will sound better than the junk factory speakers, but if you take a car stereo speaker and put it into a home stereo box, it will sound crappy. 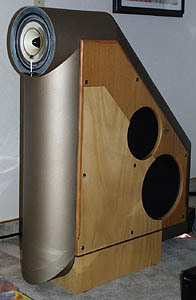 The problem is that these speakers need to have external crossovers for the seperate tweeters, midranges, and subwoofers. The best car stereo speakers are component speakers with external crossovers, but they are very expensive. 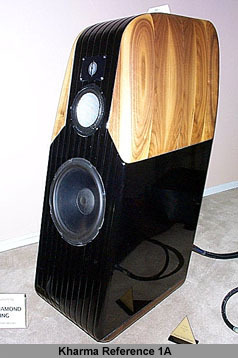 Alpine, and Boston Acoustics sell the most expensive speakers. all manufacturers should stop placing speakers on the car doors and instead use kick panel enclosures. 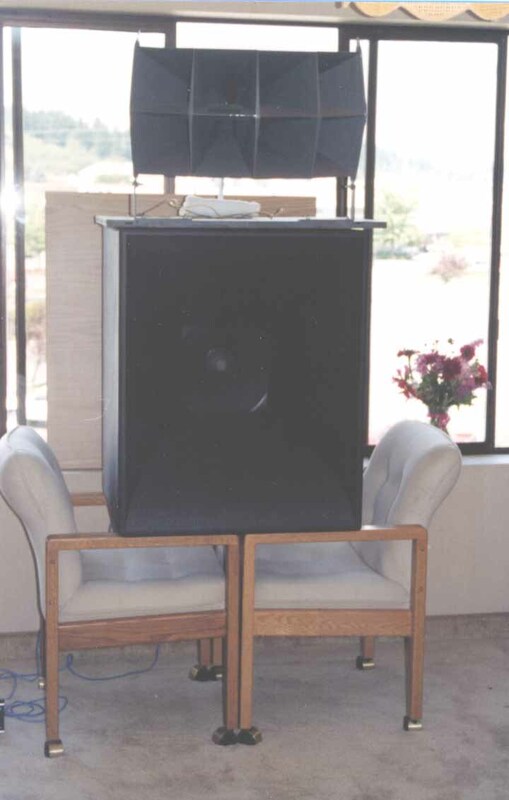 These are replacement kick panels which allow you to use the speakers of YOUR choice, in the best position for proper imaging and staging. Each panel is designed to hold up to a 6 1/8" woofer and up to a 2 1/2" tweeter. They are factory matched to vehicle interior colors, and there are currently over 200 models available, with new models constantly in development. 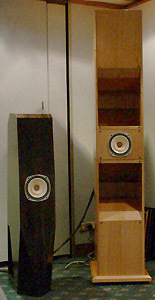 Usually when people use kick panels, they use the door speaker slots for door-mounted mid-bass speakers. If you don't know what you're doing, you can seriously ruin your car fast with this stuff, sprays are for the hard to get spots. Get a pro to install this stuff. Pacific Accessory Corporation adaptors for connecting aftermarket peripherals to factory stereos. You get full range audio signal with aftermarket amps and speakes, not a Bose specific equalized output, highpassed or lowpassed output. Technical White Papers, The Effect of Car Acoustics on Automobile Sound Systems, Level Matching for Autosound . .?or Why is my system so noisy? seem good in theory and they have ok stereo imaging and are calibrated for the cars' interiors, and ok compensation for road noise, but they do not produce not a full range audiophile sound so they ultimately disappoint. I read that Bose car stereo are actually OEM'ed from Clarion. Bose are a hassle because when you change your car battery, you have to enter a "code" to get the stereo to work again. Read this review of Bose car stereo in an Acura NSX, this is a very expensive car, but this review explains exactly why the Bose car stereo is a disappointment under the paragraph "warts." Bose is too proprietary and is a real hassle to repair and upgrade. The Bose system is not the equal of a good aftermarket system, and it's a closed-end, proprietaty system. You can't really do much with a Bose stereo except replace everything with an aftermarket system. Unfortunately aftermarket car stereos lack some kind of calibration feature like the Bose so when people replace their factory units, they get loud clear sound, but not good stereo imaging. Bose car stereos do not play MP3, CD-R nor CD-RW discs, making them useless. Email Bose to let them know your suggestions to improve their products. It's weird how very expensive cars by Mercedes-Benz and Porsche have Bose stereos that sound like crap. The best way to find car stereo dealers in your area is to look at websites for the manufacturers you are interested in and check their lists of dealers for dealers in your area. Look at the websites for McIntosh, Dynaudio Speakers, Nakamichi, and/or some high end brand listed above and look for their dealers. These manufacturers are very picky about the dealers that sell their products. You could easily go to a place like Best Buy, Fry's Electronics, etc., and buy aftermarket components and put them into your factory slots, but those places will probably not have the capability to "tune" your car stereo to calibrate it so that you will hear the best imaging in your seating position. "Serious" expensive car stereo installation is a process that includes sound proofing, custom speaker enslosure building, rewiring, and calibration. Is dynamic range compression destroying music? Roger Russell, McIntosh: "Audio Distortions Truth and Humor"
Roger Russell, McIntosh: "Audio Distortions"
Epinions: "Esoteric Hype - The Subjectivist Myth"
Glenn Gould: "The Prospects of Recording"
James Boyk: "Reflections on music & audio"
Michael Shermer: "The Difference Between Science and Pseudoscience"
"My Audio and Home Theater Home Page"
Doug Blackburn: "Real High End vs. Pretend High End"
Gordie Freedman: "What is an audiophile?" Chip Stern, writer for Stereophile: "Snobs, Slobs, & Marley's Ghost"
George Reisch: "The Darwinian Audiophile"
Walt Bender, publisher of Audiomart: "High-End Market Will Crash"
Brian Cheney: "Money and the High End: The Price is the Product"
Negativland: "Shiny, Aluminum, Plastic & Digital"
Philip Greenspun: "Stereos of the Rich and Famous"
Walter E. Sear: "What Have They Done To My Art?" Eric Barbour: "Internet Lies: The Truth About The Internet"
Vanessa Griogordiadis: expose on the ultra-rich and what they're into "Welcome to the Dollhouse"
ULTIMATE: The ultimate electronics are used by professional mastering studios. The equipment they use defines the limits of how good a recording is going to sound. 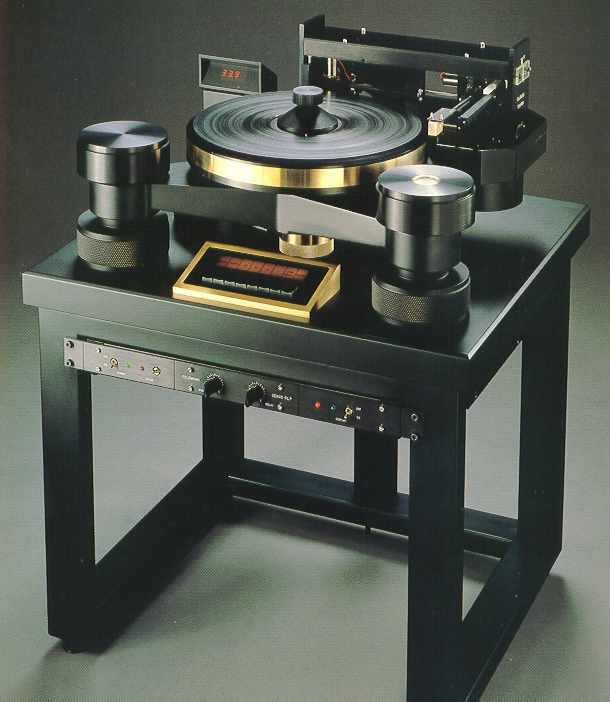 You will discover that the most expensive brands in hifi are used by professional mastering studios because they must have the best to reference their work. There are professional mastering studios for audio recordings and video recordings and the manufacturers create their best products for these uses. Professional electronics represent the best ultimate state of art. Millions of dollars, professional careers, and professional reputations are at stake so they must have the best. CALIBRATION: The biggest problem with home stereos and car stereos is the lack of calibration. There are a few aftermarket room correction products, but they add another layer in the sound chain. 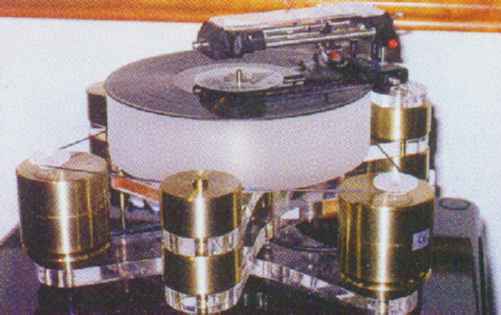 It really should be the job of the preamp to calibrate your system to your room so it would sound best to you in your listening position. It would be better if the system was equalized in the realm where the signal originates, that is, digital sources would be calibrated in the digital realm while analogue sources would stay in the analogue realm (not digitized). Bose, the notorious maker of crappy proprietary home stereos has actually developed a method of calibration that ought to be used by other manufacturers. Bose's ADAPTiQ audio calibration system is a great concept, Bose's ADAPTiQ audio calibration system demo. Pioneer's MCACC audio calibration system is great. 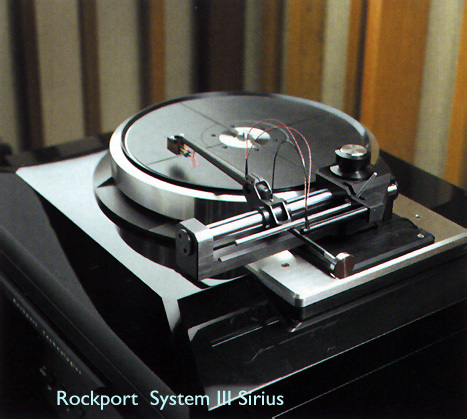 Such calibration systems should be standard on all preamps and car stereo head units. Email your favorite manufacturers to demand they start using calibration systems. ERROR CORRECTION: Digital transports like CD/DVD Players are still underdeveloped technologies. Now that more people are buying used CDs and DVDs instead of new ones, older players are having trouble with scratches on used CDs and DVDs. CD/DVD players ought to work the same way DVD/CD-ROM game machines work - the entire contents of the disk ought to be copied into memory at 24x speed, the errors ought to be compensated for in memory, and the music should be played back from memory - just like in game machines like Dreamcast, Nintendo, Sega, etc., I really don't understand what is taking the electronics industry so long to finally fully develop the concept of DVD/CD players with more robust error compensation. Pioneer Elite are starting to design buffers with "Viterbi Error Correction" to compensate for disc errors. The Denon DHT-700DV has a 4MB buffer to compensate for disc errors. Most other DVD/CD players are sorely lacking in large buffers and error compensation. Cheap crappy portable CD players actually have better error compensation than many expensive audiophile players; some have a minute of cache memory to prevent skipping when the player is bumped and to compensate for scratches. DAC: If you are using an external DAC by plugging the digital outputs from your DVD/CD player into an A/V Receiver, then it does not matter what kind of DAC is built into the DVD/CD player. You might as well get the cheapest DVD/CD player you can find with digital outputs for your A/V Receiver. 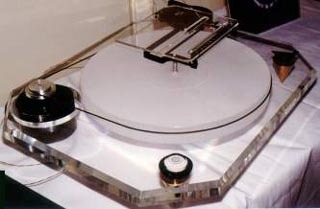 ANALOG CONNECTIONS: The only things that should be interconnected with analog connections are turntables, cassette decks, reel to reel tape decks, videocassette decks, speakers, and the output from the preamp to the power amps. Ideally, all analog connections should be balanced connections as used in pro-audio devices. You only need "component video outputs" if you have an old projection screen. DIGITAL CONNECTIONS: All connections between digital devices should be kept in the digital domain. All digital components ought to connect to each other via USB, IEEE1394 (FireWire), or in the case of DVD components, HDMI connections. Digital components ought to have plug and play compatibility and operability with digital preamp receivers. Digital signals should be kept in the digital realm. Maybe in the future all digital components will connect to each other via IEEE1394 (FireWire) or USB2 cables and have "plug and play" operability. SPEAKER CONNECTIONS: Ideally speakers should use the same kind of connectors from amp to speaker as those used in professional mastering studios. 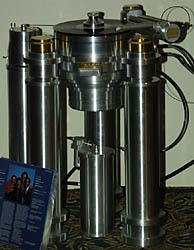 Most professional mastering studio speakers use SpeakOn Connectors, the industry standard. The next best things would be Double-banana plugs, then Banana plugs, then Spades, then Pins. The worst connectors are stripped frayed wires. It would be much easier for everybody if only manufacturers agreed to adopt professional SpeakOn Connectors or Double-banana plugs as standards for amplifier outputs and speaker inputs. 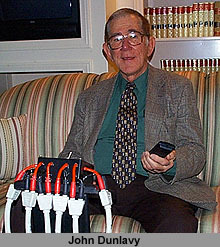 POWER CONNECTIONS: All equipment ought to have standard IEC-320 power plugs with 115/230 V switches and detachable power cords. HIFI & VIDEO MAGAZINES: The hifi magazines cheated the American public for years by not promoting all digital connections between digital components and preamps. European digital components have SCART connection standards. CABLES: Keep in mind that hifi magazines have never proven scientifically that more expensive cables have less distortion and higher fidelity. Every time a hifi magazine starts selling expensive cables, these magazines' credibility is diminished. No wonder hifi magazine readership is down, they're becoming irrelevant. If all analog components used balanced cables and all digital components used digital cables, it would make things a lot easier. PUBLIC DEMAND: Manufacturers will only improve their products if the public demands it. Go to electronics brands' websites and please send emails to your favorite hifi manufacturers telling them about these suggestions to improve their products. MARKETING HYPE: Manufacturers should not use the words "reference" or "monitor" to describe their products unless they can prove their products are actually being used by professional mastering studios. CHINESE: Chinese hifi companies are now starting to enter the world market on their own. 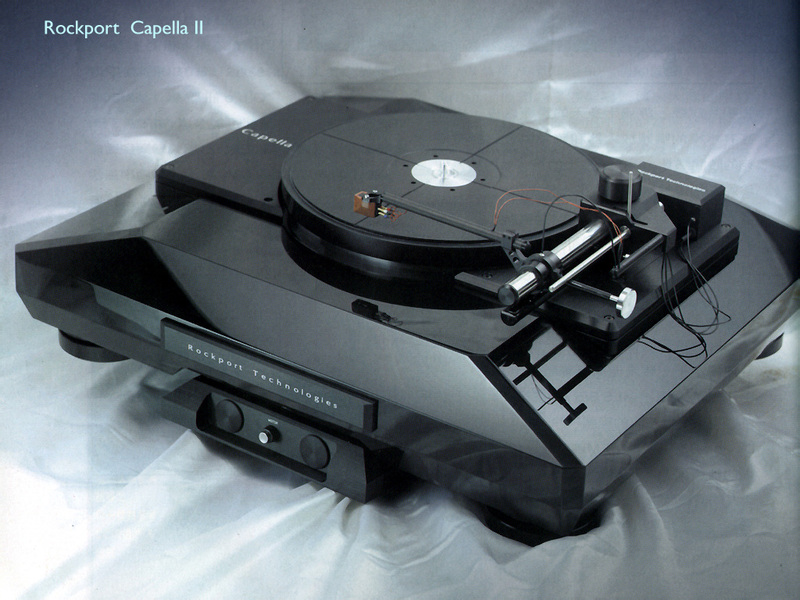 For years Japanese companies such as Denon sold rebadged OEM products by Shanling and Shengya, and Rotel and Mark Levinson's Red Rose Music sells rebadged OEM products by Korsun. Carrying on his successful story of Korsun, Mr. Zou Yuan Yuan, president and chief designer, founded Dussun. aaa-audio.com and Ming-Da products are targeting the high end, definitely not "cheap" electronics. Affordable Valve Company and PrimaLuna are getting popular in Europe. Gini's Chinese hifi is good. Many speaker brands including Klipsch, Velodyne, Infinity, Tannoy and Athena import speakers from China. A lot of hifi equipment and cables are actually rebadged imported OEM'd electronics from China with huge price markups. Maybe finally the world hifi market deserves a "wake up call" to start selling their products at reasonable affordable prices. 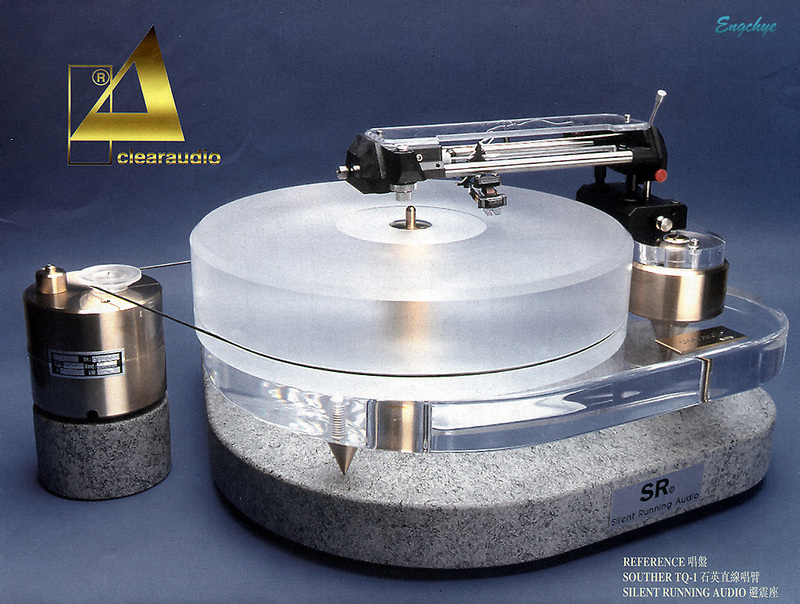 The decline in sales of hifi hardware is directly attributable to the insatiable greed of hifi companies who've raised their prices to insane tiers. This article "The Chinese way: I want to know" lists Chinese brands that are OEM'ed and rebadged by more expensive brands. This article "Busman's Holiday, China Style" shows that hifi is more popular in China than anywhere else in the world, probably, next to Japan. 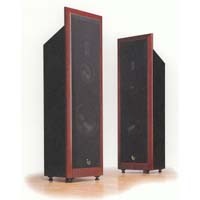 Hifi dealer Sekei, listed below, sells Chinese hifi in their native brands.